Russian Bishop's House, by Robert Spude, 1985. 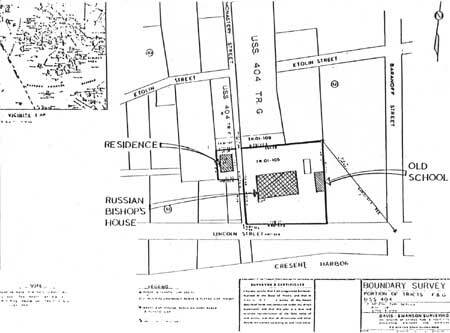 The Russian Bishop's House site includes the Russian Bishop's House and two ancillary buildings: the Old School and House No. 105. The Russian Bishop's House is a two-story log structure, 42 feet in width and 63 feet in length. The Old School is a two-story frame structure, measuring 18 feet by 32 feet, and located immediately east of the Russian Bishop's House. House No. 105 is a one-story frame structure 26 feet by 28 feet (±), located northwest of the Russian Bishop's House. The Russian, Bishop's House was built between 1841 and 1843. It was divided lengthwise into nine bays, each 7 feet in dimension, or one sazhen, a Russian unit of measure. The bays were typically fenestrated with four light casement windows topped by two light transom. The second floor south windows were made up of six light casement windows topped by a two light transom. A hip roof, probably of board material originally, covered the house. This roof was supported by a sophisticated system of rafters and tie beams which, in effect, functioned as trusses. Attached to the east and west ends of the main structure were subordinate shed roofed structures known as galleries. These were of heavy timber framed construction and housed stairways, storage, latrines, and entryways. The galleries extended the full width of the main structure and were fourteen feet (±) in width. 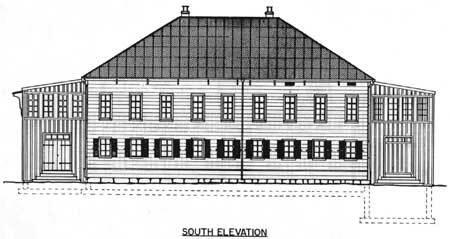 The main structure was sided on the south side (probably in 1851) with weather-boarding. The galleries were enclosed by a board and batten vertical siding. The log wall of the north elevation remained exposed until the 1887 rehabilitations. The building became the education and administrative headquarters of the Orthodox faith in Alaska, although under ownership of the Russian American Company. The first floor of the building housed administrative offices, classrooms, living quarters, and the kitchen. The second floor housed the chapel, the Church of the Annunciation, and Bishop Innocent's (Ivan Veniaminov) living quarters. There were problems with the structure as time passed. The roof leaked and the unseasoned wall logs shrank as they air-dried in place. The side galleries were roofed with sheet iron in 1849. In 1850 Bishop Innocent made recommendations for the rehabilitation of the structure to the Cathedral Arch-Priest Peter Litvinstsiev, who formalized the request in a report to the New Archangel Ecclesiastical Consistory. In 1867 following the purchase of Alaska by the U.S. Government, the Russian American Company transferred ownership of the site, along with other church-related properties, to the Russian Orthodox Church in North America. Sometime after 1867 and prior to 1885, a small porch was constructed at the main entry on the south elevation of the Russian Bishop's House. In 1872 permission was given to transfer the seat of the diocese to San Francisco. During the absence of the Bishop, spatial uses were altered: living quarters for the priests were moved upstairs and a second-floor kitchen was added. However, the house suffered much neglect, and by early 1886 permission had been sought from the St. Petersburg Synod for major repair work. It was completed in May 1887 under the supervision of Peter Callsen. The 1887 repair and rehabilitation work is one of the key events in the building's history. The original timber-framed stairwell galleries were replaced and siding was placed on all four sides of the structure. Rotted sill logs were replaced in the north wall. The interior was repaired and painted. Two doors in the chapel were sealed and a new one installed. Also at this time nearly an entire interior crosswall was removed, creating the large southwest room on the first floor of the house. During the late 1880's part of the lower floor was used as an inn for travelers. In approximately 1896 a small one-story frame addition that functioned as a washroom was added to the east gallery. Also during the 1890's a door into the north end of the west gallery was closed. It is also probable that the roof was reshingled very early in the twentieth century. By the turn of the century the two original classrooms on the first floor were being used as bedrooms for orphaned boys. In 1903 an auxillary diocese was established for the Aleutian Islands and Alaska with a Bishop at Sitka. This was the first time since 1872 that a Bishop had been in full-time residence in the Bishop's House. Now the space functions again changed as the priests made room on the second floor for the Bishop. During the twentieth century the first floor of the Bishop's House continued to evolve in use while the second floor continued to house the chapel and the Bishop's quarters. During the 1920's (and possibly earlier) local newspapers, the Sitka Sun and Sitka Tribune, were both printed in the building in conjunction with a church printing shop. During the late 1920's the lower floor was converted into three apartments, while the large room in the southwest corner of the building was used for meetings and other activities. It is likely that electrical and plumbing systems were initially installed by this time. In 1936 the community library was housed in the large southwest room after the library building burned. In 1949 this same room was turned into a gift shop, and the west window in the south wall was enlarged for a door. The Sitka Historical Society also used the room for a meeting place and artifact storage from 1957 through November 1966. The first floor apartments were closed in 1967. Finally, in 1969, Bishop Theodosius moved into a new residence, leaving the building empty. The Old School was constructed in the late summer of 1897 for a kindergarten and girls' classes. A circa 1900 photograph shows the building had a masonry chimney and four-over-four light, double-hung windows. These are still in existence, although deteriorated to varying degrees. A circa 1905 photograph shows wood shingle roofing. By that year, gutters and downspouts had been installed. Church records show that in 1908 repairs were made to floor, windows, doors, and fireplace. In a circa 1915 photograph an enclosed stairway, an addition, shows at the north end of the building. The date of this addition is not known. It is still in existence although in a deteriorated condition. In March of 1922, Bishop Dashkevich recommended the entrance of the Old School face the American public school to its east. Consequently the original west entrance was closed up and replaced with a double-hung window. The interior stairway at the west entrance was removed. A 1924 photograph shows the addition of a stairway on the east exterior. This stairway is no longer present. There is little documentation concerning changes to the Old School from the 1940's to the present. In 1922 there were large undivided rooms on both floors. In a 1943 photograph it appears that north-south center walls were installed in both the upstairs and the downstairs rooms. Asphalt shingle siding was applied in 1963 and removed in 1981. A 1965 photograph shows a structure attached to the north end of the building; this structure has since been removed. In the 1960's and 1970's it appears the building became a tenement. The interior now includes a living room/bedroom area at the south end of the building, entry way and storage area, and kitchen area on each floor. The third building at the site, House No. 105, was built in 1887. Its intended use was as income or rental property. Originally located 100 feet north of the Russian Bishop's House, it was described in 1892 as having four rooms. In 1936 the lot on which House No. 105 was located was sold to the City of Sitka. It is not the house was moved off that lot then; long-time Sitka residents indicate it was moved to its present site in the late 1950's or early 1960's. A six-over-six light, double-hung window had been replaced by 1974 with a one-over-one light window. Photographs from 1975 show the windows boarded over and the building with a rear addition. The date of the addition is unknown. In 1962, under the provisions of the Historic Sites Act of 1935, the Russian Bishop's House was designated a National Historic Landmark. A national survey of historic sites and buildings form was completed in July 1965. With the passage of the National Historic Preservation Act of 1966, the Russian Bishop's House, known at the time as the "Russian Mission Orphanage," was placed on the National Register of Historic Places. Congress allocated funds to purchase the site on October 18, 1972. In 1973, after one hundred and thirty years of continuous use of the site by the Russian Orthodox Church, the National Park Service took possession of it. In 1980, the site was redesignated the "Russian Bishop's House" on the National Register. By that time the weathering, foundation problems, and leakage had taken their toll on the Russian Bishop's House. Interior finishes were falling away while exterior siding rotted and buckled. 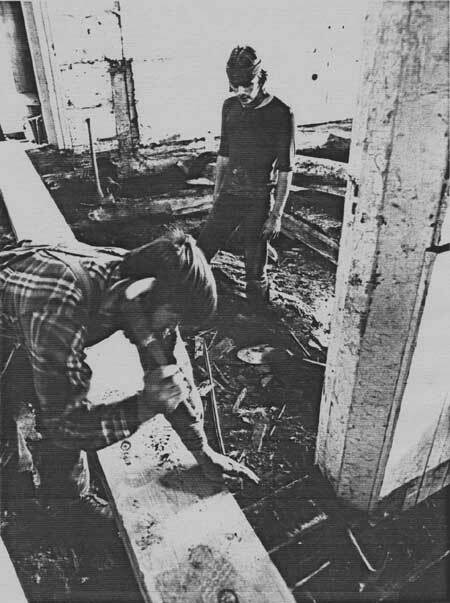 In the summer of 1976 the National Park Service removed extraneous modern partitions on the first floor, removed and stored the handhewn historic first floor planking, and conducted more extensive investigations of the historic fabric as well as stabilization work. The additional fabric investigation dramatically showed the necessity of providing a foundation for the main structure and replacing rotten wall and sill logs. Five phases of a complex six-phase restoration project have been completed as of this writing. The structural integrity is now assured and the external restoration is now complete. Phase six will involve interior restoration on the second floor and adjustments for adaptive use on the first floor. The overall form and much of the fabric of the Russian Bishop's House has not changed extensively since 1843 with the exception of the galleries on both ends of the building. These were removed and replaced in 1887. The Old School was used for storage for some years; it is now boarded up and not in use. The professionally recommended treatment for the Old School is that the exterior of the building be restored to an appearance of the 1896 to 1922 period and the interior be adapted for National Park Service uses supporting the operation and maintenance of the Russian Bishop's House. The purpose would be to create a rehabilitated, functional facility with an historic appearance. (This would not, however, be an academic restoration.) Due to limited funds, management is proceeding with an alternate method of treatment described in the historic structures report. The building will be stabilized and will remain closed to the public. It will continue to function as an architectural buffer between the Bishop's House and the adjacent modern development. In 1976 the interior of House No. 105 was adapted for use as a "construction shack." The chimneys and rear addition were removed. These and the rear doorway were boarded over. The interior floors and walls were covered with plywood. The house has continued to function as a "construction shack" to the present. Recommended treatment for House No. 105 is repair and stabilization. Russian Bishop's House interior restoration, by Robert Belous, 1978. Russian presence in the New World does not loom large when one is surveying those nations that explored, exploited, and settled the North American continent. However, lasting monuments to the Russian venture in North America were left by the Russian Orthodox Church missionaries: buildings and, the living proof of their work, the Russian Orthodox community in Alaska. Russian Bishop's House site at Sitka was a cultural and educational center in Alaska from the 1840's to the mid-twentieth century. 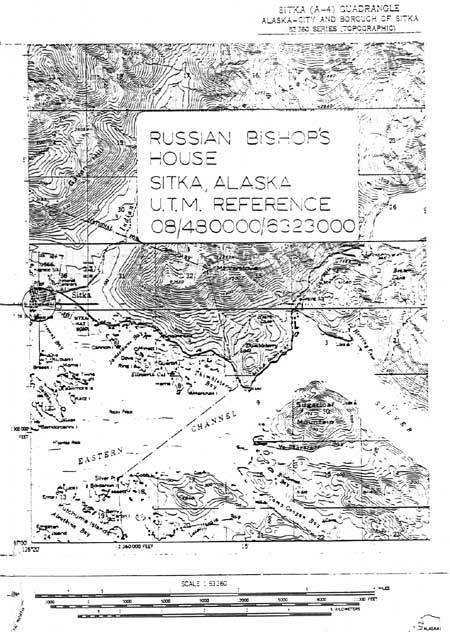 The Russian Bishop's House was the residence of Ivan Veniaminov, the great Russian religious leader and first Bishop of Alaska, and the administrative center for his and other Orthodox missionary efforts among the peoples native to Alaska. The great religious and moral influence exerted from this missionary center can be observed by the large numbers of Orthodox communicants living in the Aleutian and Pribilof Islands, and other Alaskan coastal communities. In addition to the historical significance associated with the site, the Russian Bishop's House is significant architecturally because of the high quality and unique construction characteristics of Russian vernacular design, such as the intricate joinery methods. The Russian Bishop's House is significant in the category of engineering because it displays a building system that is capable of distributing structural loads in a more sophisticated manner than that typically found in log construction on this continent. The roof truss system exemplifies this. Also important in the category of engineering is the effective system of heating and conserving heat in the building, exemplified by the gallery "airlocks," a method unique and sophisticated among log structures on this continent. Historical and building elements are discussed in more detail below under the categories of historical, structural, architectural, and environmental characteristics. The Old School and House No. 105 are addressed in the ancillary buildings section. Returning from Russia to Sitka on September 27, 1841, with the rank of Bishop of Kamchatka, the Kuriles, and the Aleutians, Ivan Veniaminov set about expanding the educational and missionary efforts among the peoples native to his vast diocese. Native schools were established at St. Paul's Harbor (Kodiak), Alma Island, at the Nushagak and Kvikhpak missions, and Bering Islands. From a missionary center at Redoubt St. Michael on Norton Sound his emissaries even penetrated into the lower Yukon and Kuskokwim River basins. Existing schools, such as those at Unalaska and the Pribilof Islands, were continued and improved. Adolph Etolin, Governor of Russian America, and chief executive of the Russian American Company in America, had the Russian Bishop's House built to fulfill obligations to the Russian Orthodox Church set forth in the Tsar's Ukase of 1821. The House was built to serve as Veniaminov's residence, office, and private chapel. The cornerstone of the Russian Bishop's House was laid sometime in 1841. By December of 1843, the substance of the work was completed at a cost to the Russian American Company of 25,000 rubles. When Fort Ross in California was evacuated by the Russians in 1842, the church paraphernalia in their entirety were moved from the California chapel to Sitka and placed in the Bishop's chapel, also known as the Church of the Annunciation. 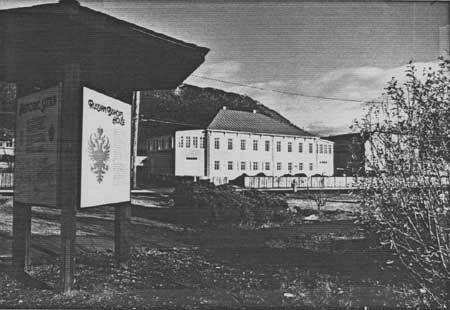 In 1841, Veniaminov established an ecclesiastical school for Russian children and children of mixed blood at Sitka. This institution was located in the Russian Bishop's House after 1842. In 1845 the school was elevated to the status of a seminary, where the subjects of study were Russian, English, religion, mathematics, navigation, history, and bookkeeping. In 1858, the seminary at Sitka was transferred to the Asiatic mainland and, in 1859, Veniaminov left Alaska to work in Siberia. He became the Metropolitan of Moscow in 1867 and died in 1880. As a result of Veniaminov's and later missionaries' efforts, the number of Orthodox communicants in Alaska increased from 5,512 in 1841 to 9,568 by 1860 and were scattered over a vast region. In 1867 Russian America was sold to the United States and the North American Orthodox Church reorganized. It continued to prosper until the Bolshevik Revolution of 1917 abruptly halted Russia's support for the North American diocese. After 1917 there was little change or growth in the diocese for nearly 40 years. In 1967, however, the Church, with new leadership and a renewed sense of mission in Alaska, began expanding its program in Alaska. In 1979 there were 75 Orthodox communities in Alaska, 30 with churches and the remainder with chapels. Twenty-two priests, 16 of them Native, served a far-flung diocese. The foundation system of the Russian Bishop's House was originally stone rubble. Uniquely, this was constructed to conform to the grade, with the stones decreasing in size as the grade rose. In this manner the foundation provided a fairly level surface on which to set the structure. Typically, full-length Sitka spruce logs were used in the walls. Adolph Etolin was a native of Finland and it is known that he was accompanied by skilled axmen from his country. They were unexcelled as timber workers, and most of Sitka's finest log buildings were hewn by them out of native spruce. 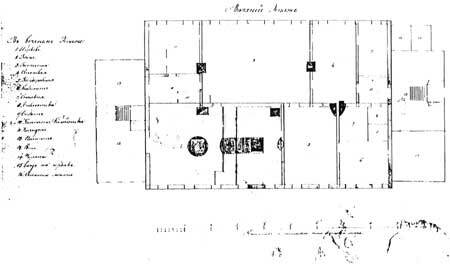 Thus a good possibility exists that Finnish craftsmen constructed the Bishop's House. 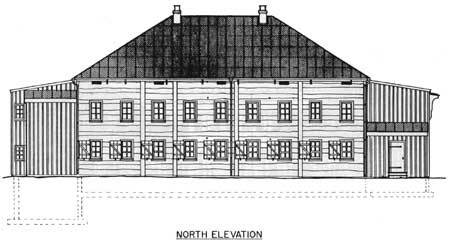 Russian and Finnish construction methods were similar, and typical Russian architectural detailing of the period was employed. The joinery of exterior corners and of the interior walls to the exterior walls. display a sophistication superior to that usually found in log construction on the North American continent. Of special note is the roof framing method. It is composed of a log rafter system in hip roof form, with opposing rafters connected at their lower ends by a "tie beam," thus creating a truss system. Window and door jambs are mortise and tenon joined and wedged into place at the head, providing structural stability at openings in the log walls. Other sophisticated detailing is found on such elements as the original door hardware, some of which have brass cover plates over iron hinge leaves. Ivan Veniaminov (Bishop Innocent) may well have drawn the original plans for his residence, as he did for St. Michael's Cathedral. The original floor plan represented the integration of structural and functional needs. Several elements in the structure are noteworthy in regard to control of the environment. The galleries functioned as air locks, preventing direct heat loss from the main structure to the exterior. Oakum and moss between exterior wall logs prevented moisture entry and heat escape. Sand insulation between floor and ceiling planks provided audio and thermal barriers. The first floor was heated by cylindrical iron stoves. Massive masonry stoves at the second floor were fired during the day and slow released heat during the night. High door tresholds and partial walls helped control drafts and the distribution of heat among the rooms. The Old School served as a Russian Orthodox Church school from 1897 to 1922, and as a public school for the following decades. It reflects the influence of the Russian Orthodox Church in the educational aspect of Alaska in the late nineteenth and first quarter of the twentieth centuries. While House No. 105 is located within the boundaries of the Russian Bishop's House site, it remained outside direct involvement with church activities, serving mainly as a rental property and, at times, as a priest's residence. No notable persons or events have been related to House No. 105. The historic correspondence indicates the building was considered substandard from the late 19th century on, an assessment that still holds. Historic Resource Study, The Bishop's House, James Mote, National Park Service, Denver Service Center, Denver, Colorado, 1980. Historic Structure Report Architectural Data Section, Russian Bishop's House, Paul C. Cloyd, E.I.T., National Park Service, Denver Service Center, Denver, Colorado, 1980. (Draft) Historic Structure Reports for House 105 and the School: Administrative, Physical History and Analysis Sections, Paul C. Cloyd, E.I.T., National Park Service, Denver Service Center, Denver, Colorado, 1982. Russian Orthodoxy in Alaska, Barbara S. Smith, Alaska Historical Commission, Anchorage, Alaska, 1980. The boundary is coterminous with the southeast portion of Tract G formerly called the Greek Church Mission Reserve and now owned by National Park Service. The site is a rectangular lot with the upper left quadrant intersected by Monastery Street and the lower left quadrant missing. It is bordered on the south by Lincoln Street. The property line proceeds north from Lincoln Street approximately 100' at 56°30'W., 70 feet west along the north property line to N75°44'E.